KS Service Tool v1.0 is a small application for windows computer created by KS GSM Team, which allows you to quickly service your android device using its simple and graphical user interface. 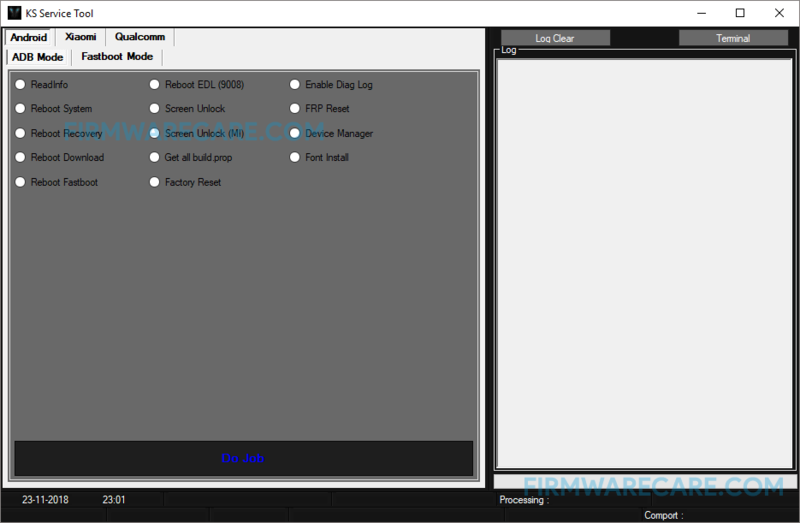 The several features of KS Service Tool v1.0 includes reboot system, reboot recovery, screen unlock, factory reset, FRP reset, font install and many more. KS Service Tool v1.0 supports qualcomm android devices. It also supports Xiaomi smartphones. KS Service Tool v1.0 is a complete package to service your android phone. The tool comes with set of options to be performed under both ADB mode and Fastboot mode. The user interface also allows you to track your task during process. In order to use the KS Service Tool, you need to install the Universal ADB Driver on your computer. [*] Compatibility: The KS Service Application runs perfectly on Windows XP, Windows Vista, Windows 7, Windows 8, Windows 8.1 and Windows 10 (32 bit and 64 bit). [*] Credits: KS Service Tool is created and distributed by KS GSM Team (developer). So, full credits goes to KS GSM Team (developer) for sharing the tool for free.